zoom in all the way. go edit > define pattern. get your image that you want to put the border around. if it has more than one layer go layer > flatten image. 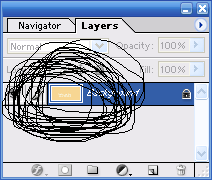 it should now say layer 0.
go layer > layer style > stroke. change it to 1px, CHANGE THE POSITION TO INSIDE. change fill type to pattern, pick the pattern you made (the checkerboard thing) and click okay. ohsodopey. if no one has helped you....try going to your "Edit" drop down menu. Stroke might be under there. i have Editor Photoshop Elements and i was guessing it would be the exact thing but when i go to layer >layer style it doesnt give me the options for stroke . Can you help me? how do u put it on the pic. nevermind i got it, thanks for the tutorials :D great job!